Unitrunk, the company behind Rapid installation System (RIS), is reportedly the first cable management specialist in the UK to pass fire safety testing for both its cable tray and cable ladder, providing peace of mind for specifiers, developers and end users. The move pre-empts any mandatory requirement to certify cable management systems for fire safety, and has seen Unitrunk proactively choose to undertake fire testing in response to general concerns about the safety of all elements of construction specifications. 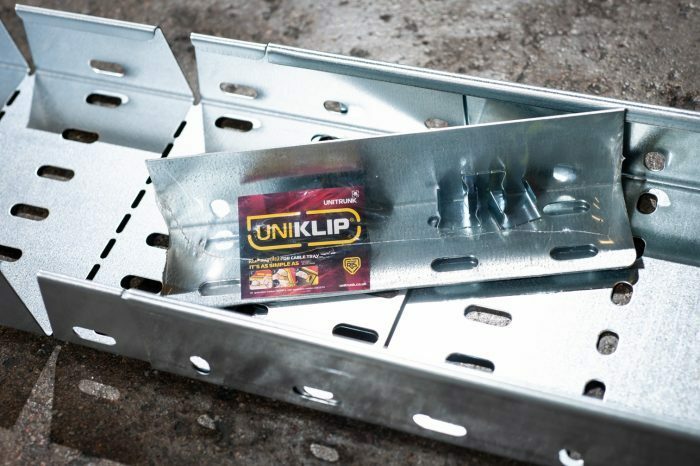 Independent third party tests have been carried out on Unitrunk’s pre-galvanised UniKlip cable tray from the RIS range, involving both heavy duty UniKlip and medium duty UniKlip, which achieved a fire rating of E90, indicating that the system can withstand temperatures rising to 1000°C for at least 90 minutes. The company’s EasyConnect basket tray is already E90 certified for fire resistance. Other Unitrunk cable management systems that passed the stringent fire testing process include hot-dip galvanised cable tray and Speedway SW4 medium duty cable ladder in both stainless steel and hot-dip galvanised. Unitrunk’s Commercial Manager, Martin Gregg, comments, “Our decision to invest in fire safety testing for UniKlip, hot-dip galvanised cable tray and Speedway SW4 cable ladder system stems from a belief that this should be integral to quality assurance processes for all cable management systems, regardless of whether compliance to a standard is required. To pass the fire tests, all the cable management systems had to withstand a temperature curve as high as 1000°C whilst the cables in the system maintained circuit integrity. The cable management was then fire rated based on the number of minutes they were successfully able to withstand these conditions.